Just some of the campaigns I have devised and project managed. This campaign followed a series of stabbings involving young people in the borough of Enfield. Don't Carry, Don't Kill urged tougher sentences on teenagers who carried knives. Although a hard-hitting campaign, the wave of recent crime had caused considerable alarm in the community with many urging action. The campaign was designed to constructively address the issue. The campaign engaged the support of local MPs who helped to push the amendment through the Parliamentary process. It ultimately was written into law. A tea hut in Epping Forest was threatened with closure by the land owners. The tea hut had been run by the same family for decades and it was clear that there was a large amount of support for it. I devised and launched a public campaign in the East London Guardian Series to help save it and put pressure on the land owners. The campaign made considerable use of social media, especially Facebook, to raise awareness of the campaign among the biking fraternity, who used the tea hut as a regular stop off. The campaign gained the backing of politicians including the Deputy Speaker of the House of Commons, as well as artist Grayson Perry, and was ultimately saved. The Watford Observer was instrumental in helping to open the Peace Hospice in the town. To celebrate its 25th anniversary, I joined forces with the hospice to launch a campaign to help raise funds and awareness. I toured the hospice and met many of the staff and used this to help promote the launch. In partnership with the hospice, we planned a series of feature articles over the course of 12 months looking at all aspects of the hospice and its history. 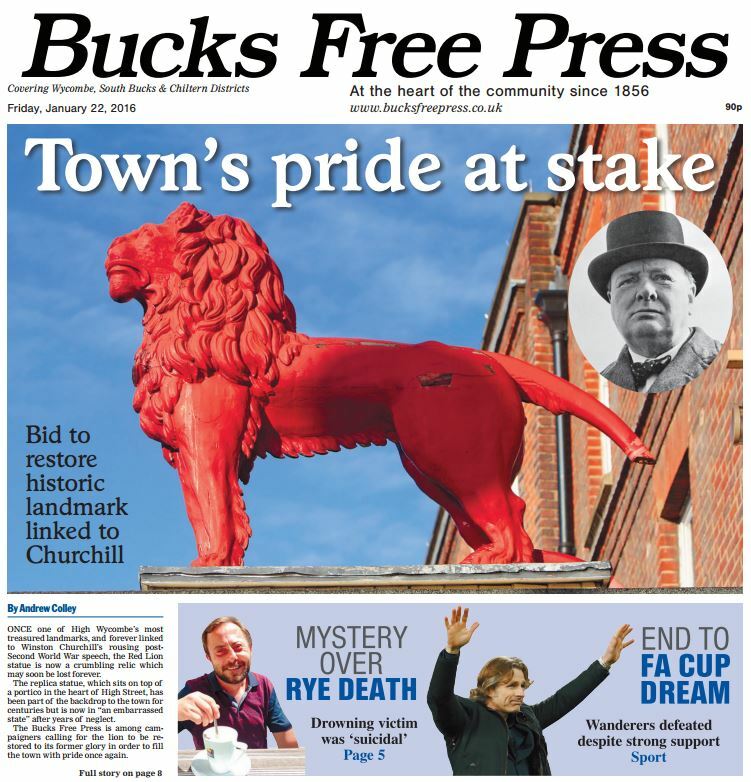 A front page I designed to launch a campaign to restore the historic red lion in High Wycombe. The carving is associated with figures such as Churchill and Disraeli, who gave speeches from the window overlooking it. The campaign was designed to tap into strong community sentiment and interest in local history matters, evidenced by surveys, analytics and demographics data. The campaign ran over many weeks, with planned features published on various aspects of its associated history. The publicity put pressure on local councillors. The campaign succeeded as the Lion was restored and the newspaper won many plaudits in the process. Health matters are among the number one topics of concerns and affect everybody. I therefore launched a campaign giving voice to patients and hospital workers who otherwise did not have a public forum to speak in. The campaign was both positive and critical in its stance. On the one hand keen to highlight the incredible work of many NHS staff. On the other, raising awareness of the many challenges faced by the health service. The campaign ran for more than 12 months and appeared in the printed paper as a regular full page. A community campaign designed to highlight the extent of potholes on the roads in Essex. This was in response to a number of articles written on the subject and a considerable postbag of letters from readers. I judged that a straight, serious campaign would not be hugely exciting, so decided a more light-hearted approach would attract more widespread appeal. I came up with the superhero concept and assigned the role and responsibility to a reporter. The silliness of the campaign succeeded in attracting widespread comment, even from much further afield. The campaign succeeded in putting pressure on the highways authority to at least carry out temporary repairs, while also further reaching out to readers and building audience. This example also demonstrates the use of video to support the campaign. Reader promotion aimed at local charities. The Gannett Grants were run annually and as Editor I actively forged close links with many and encouraged them to apply. Partnership with Tesco to give charities and groups the chance to win up to £12,000. Newsquest has announced the departures of two group editors, leaving another in charge of 18 titles. Newsquest has appointed Tim Jones to head up North London’s Times and Independent Series, the Watford Observer and the St Albans and Harpenden Review. Nine editorial posts including two deputy group editor roles are set to be cut as part of a management shake-up by a regional publisher. A weekly newspaper series secured an exclusive interview with its local MP Iain Duncan Smith after a petition called for him to live on £53 a week. Two dedicated weekly newspaper reporters are not letting the travel chaos of the past week affect their duties. The National Union of Journalists has described more than 30 redundancies at Newsquest titles in London, the north-east and the Home Counties as a “massacre” and said the regional publisher appears to be “at war” with its staff. Newsquest‘s weekly newspapers in south London reported 550,000 websites visitors and more than two million website page views in the space of three days this week as journalists worked round the clock to provide coverage of the riots which swept the capital.